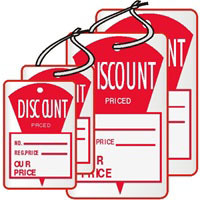 This is a small (1 1/4 x 1 7/8) white tag that has the words DISCOUNT PRICED in white letters on a red ink background. Then in red ink it has NO., REG PRICE and OUR PRICE with a corresponding red line for each.This sale tag has a string and is packed 1000 TAGS per box. If you prefer, we also have this sale tag with no string.